Mid-Carolina High School along with the guidance department sponsored two very informative workshops during Parent/Teacher conferences on Thursday, January 17, 2019. At 5:30 p.m. a representative from Piedmont Technical College shared information with 11th grade parents and students wanting to take Dual Enrollment courses as a 12th grader. This session discussed the process and procedures for registering and providing all needed documentation for taking dual enrollment courses. 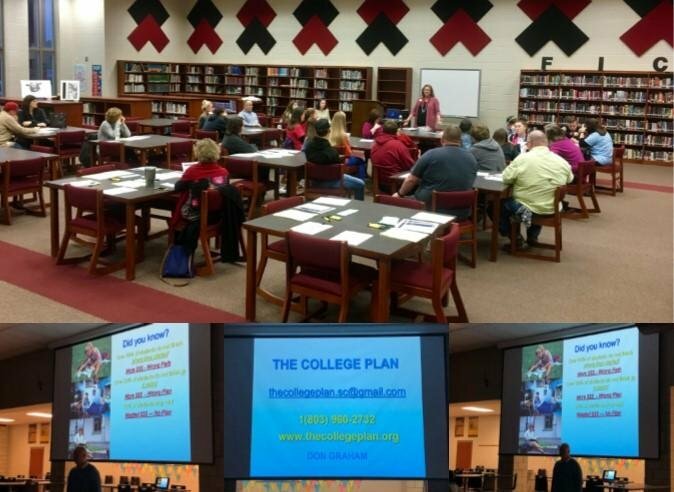 At 6:00 p.m. an Education Specialist presented information to students and parents on “The College Plan”. This plan is a free assistance program in all areas of College Planning and Funding. Students and parents can find education costs manageable and the college experience rewarding through a “College Planned Path”. THE COLLEGE PLAN CAN BE YOUR SOLUTION: if you are not sure what college to select; if you don't know the FAFSA do's and don'ts; if you don't understand the importance of the EFC; if you have not examined the 156 strategies to increase aid; if you don't understand FELP.